You know that moment when a child does or says something that makes you suddenly feel really old? That was me a month or so ago when my niece Jazmyn told her mum (my best friend Katie) and I that she wanted “a Tumblr party”. I’ll admit, I had vaguely heard of Tumblr, but considering I can barely keep up with Facebook, I’m sporadic with Pinterest, and I’m only just slowly easing my way into Instagram, investigating this mysterious Tumblr thing was not on my list of priorities. After a bit of questioning, a few Google image searches, and a (for me) scarily perky YouTube video called “How To Be Tumblr” we eventually figured out that what Jaz liked about the Tumblr images she’d been looking at were the bright colours, room decor and, um, donuts. Sprinkles also seemed to feature heavily. That’s when I perked up, because sprinkles I can do. Sprinkles, I understand. Sprinkles are kinda my thing. The cakes we talked about were very sprinkly, and Jaz also liked the “drippy cake” trend inspired by Katherine Sabbath‘s fabulous cakes, so I threw those ideas together with a watercolour effect like some of the fanciful, pastel-y coloured Tumblr photos we’d been looking at. 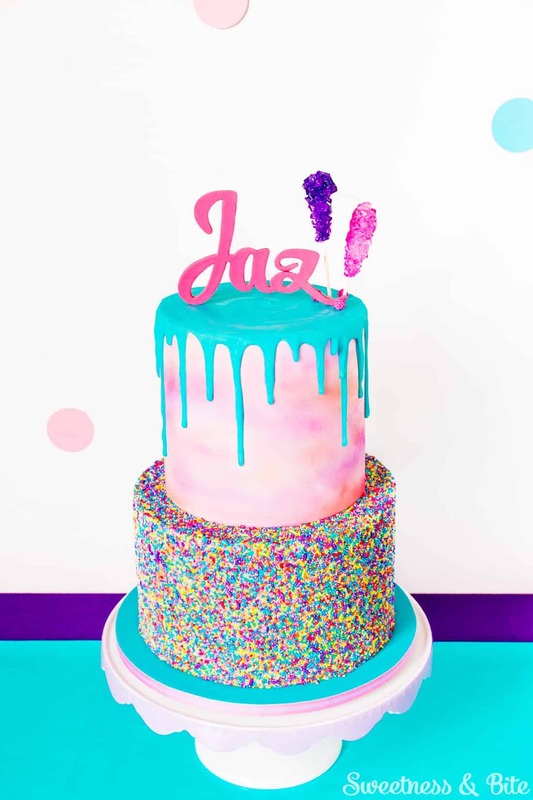 I’ve got a couple more tutorials coming up for the sprinkle tier of this cake, and also the watercolour effect I did on the top tier, but I thought we’d start right at the top and talk about the gumpaste name cake topper. Customised acrylic cake toppers are so popular right now, and if I’d designed this cake a few weeks earlier I may possibly have actually gotten my act together and ordered one. But you know… it didn’t so much happen that way. Enter some surely-I-can-make-something-myself-? thoughts, and the results weren’t too bad at all. 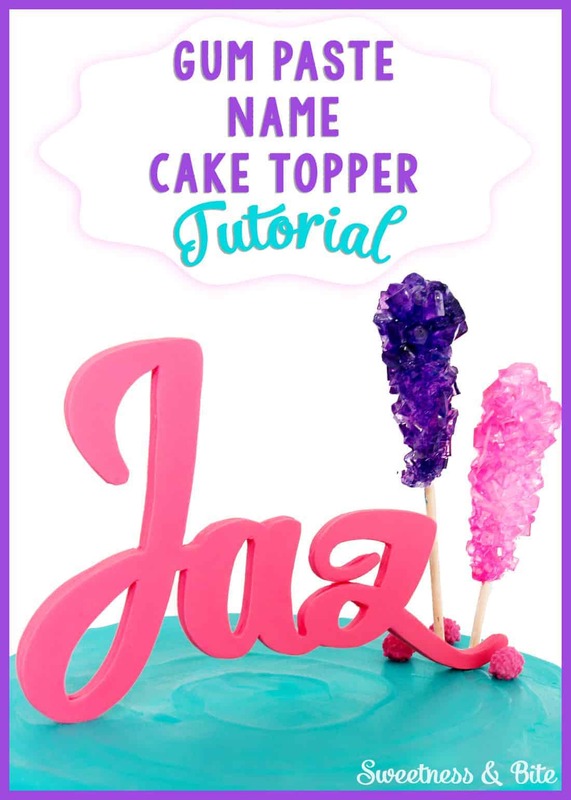 The easy route would have been to cut out individual letters in a block font, but I wanted a look similar to the gorgeous toppers made by businesses like Design at 409, Glistening Occasions and Communicake It, so I picked out a cursive font. I knew it would have some weak points where the letters joined together, so instead of cutting out one thick piece of icing, I decided to sandwich pieces of wire between two pieces of gum paste to reinforce the topper and make it less likely to crack. 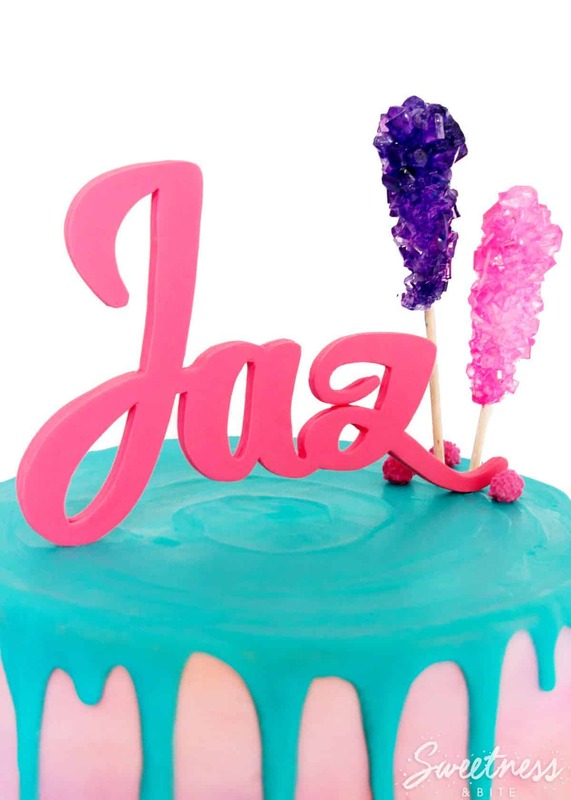 Clearly this means that despite being made from gum paste it’s not an edible cake topper, unless you enjoy flossing with wire, but it gives you the benefit of being able to use whatever font you like, make the topper whatever size you want, and colour-match it to the rest of your cake. I haven’t yet tried this with a longer name, but my guess is that it will work best for names under 6 or so letters. That’s not to say it definitely won’t work for longer names, but if you do try it with one, make sure you add plenty of the reinforcing wires, make the support wires (the ones that you’ll insert into the cake) thicker or use florists tape to attach some skewers to the wires for extra support. And always, always make a backup topper. 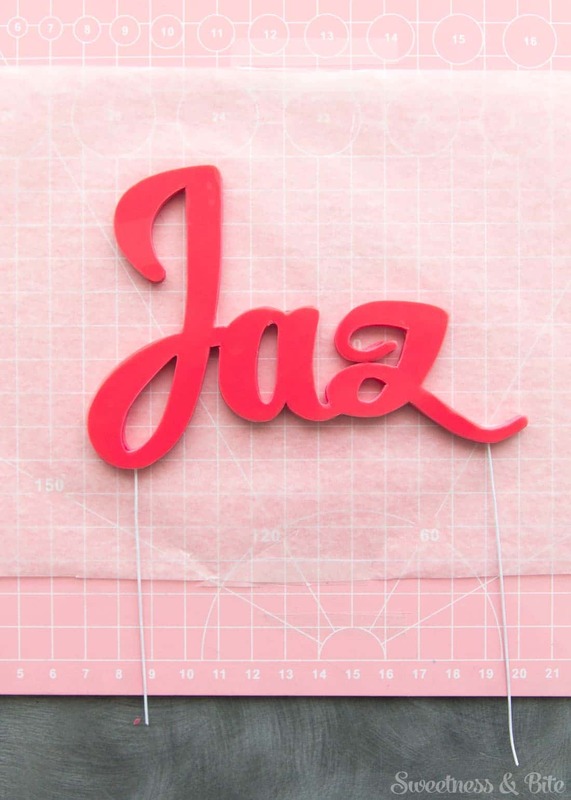 You can also use the instructions for cutting the letters to make a name using individual letters in a block font, just cut each letter out from a thicker piece of gum paste (4mm or so is good) and insert a toothpick or skewer into the bottom of each letter. 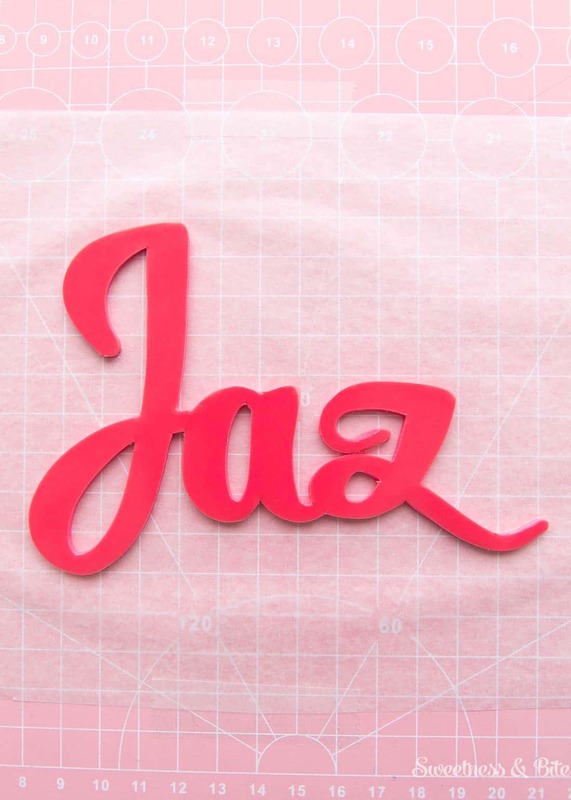 There aren’t any terribly fancy tools needed for this, but a silicone-tipped colour shaper (from an art supply store) or the wedge tool from a set of Sugar Shapers (their new mini shapers are on my drool-list) will make smoothing the edges of the letters a lot easier. I cut up a thin plastic document sleeve to make my template, but you can use any thin, flexible plastic that is similar in thickness to acetate (or, if this helps, like good old fashioned overhead projector sheets. Ahh, primary school memories.) 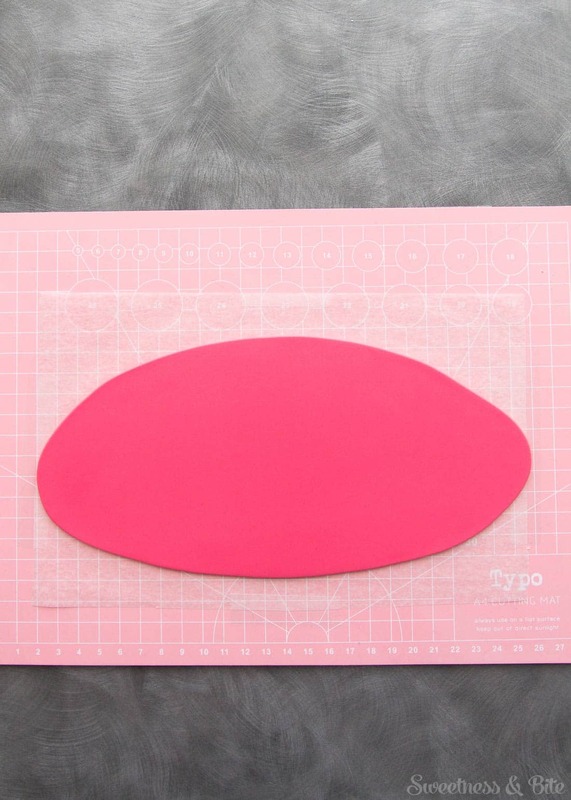 Any of the thin plastics that I show in my gumpaste name cake topper tutorial will work here. I should warn you that this is a real watch-the-work-in-progress tutorial, no prettily staged and photographed stunt-toppers here, all these photos were taken as I made the topper I used on the cake, and the back-up topper. The only way it could be more raw and even less professional is if I’d videoed myself making it whilst wearing my pyjamas and then uploaded it to YouTube for you to watch. But don’t worry. I’ll never make you suffer through anything like that. I’ll just let you read through it and look at the pictures. Of the topper, I mean. Not me in my pyjamas. Gum paste (or fondant mixed with tylose). I have the best results with Satin Ice gum paste. Choose your font and write out the name. I did this in Photoshop, but you can use Word, Pages or any other program that you’re comfortable using. 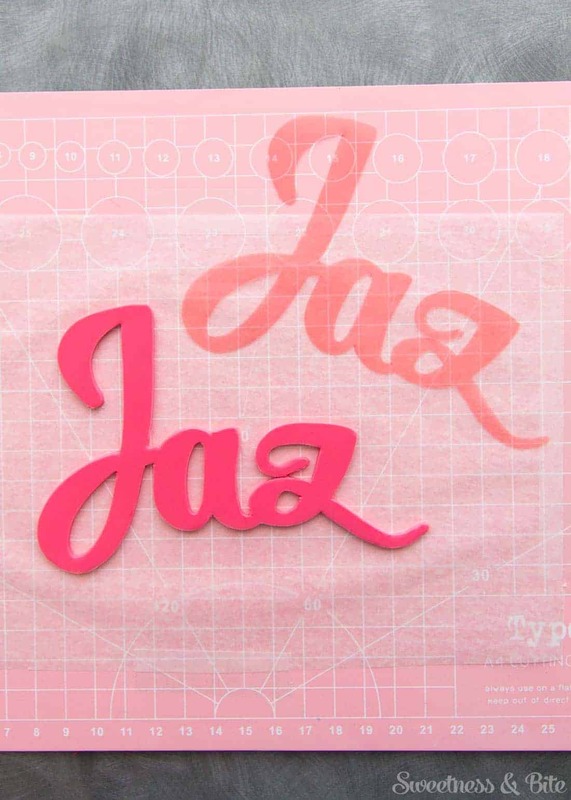 For Jaz’s name, I used ‘Salamander’ font, and did the ‘J’ and ‘az’ on separate layers in Photoshop, so that I could move the ‘az’ lower to make sure the the end of ‘z’ was in line with the end of the ‘J’. Where the bottoms of those letters sit is where the name will sit against the cake, and where we will insert the supports. Don’t be put off, that’s just what I had to do to make these particular letters work. With most other fonts the bottoms of the letters will line up on their own. Have a look at your lettering and pick out the places that you think will be the weakest and most likely to break. Here I figured it would just be the joins between the letters. 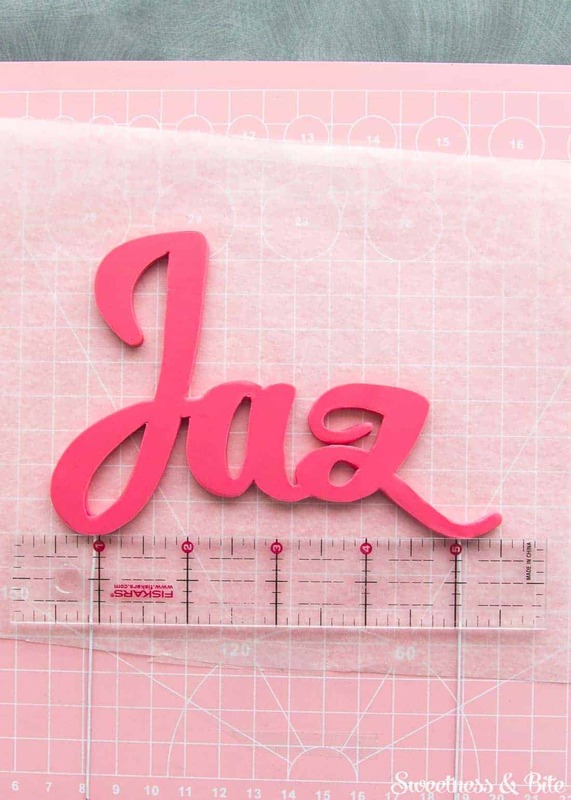 Cut small pieces of 22 gauge wire and curve and bend them to shape, ensuring that you make them long enough to bridge the weak point and reach a thicker part of the letters, which won’t be so fragile. Then find the bottom points of your letters (here the tails of the J and Z.) where the base of the letters will sit against the cake. Curve the end of some longer, thicker pieces of wire to shape, then bend the wire so that it will go straight down into the cake. Set the wires aside. Roll out your gum paste, to about 2mm thick (I used #2 on my pasta machine). Make sure the piece is big enough to fit the name. Place it onto the Crisco rubbed paper. Rub the back side of the plastic template with a very thin smear of Crisco, then place it onto the gumpaste. Gently run along the letters with your finger to make sure they’re stuck to the gumpaste. 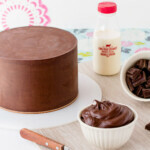 You can also rub over it very gently with a fondant smoother. 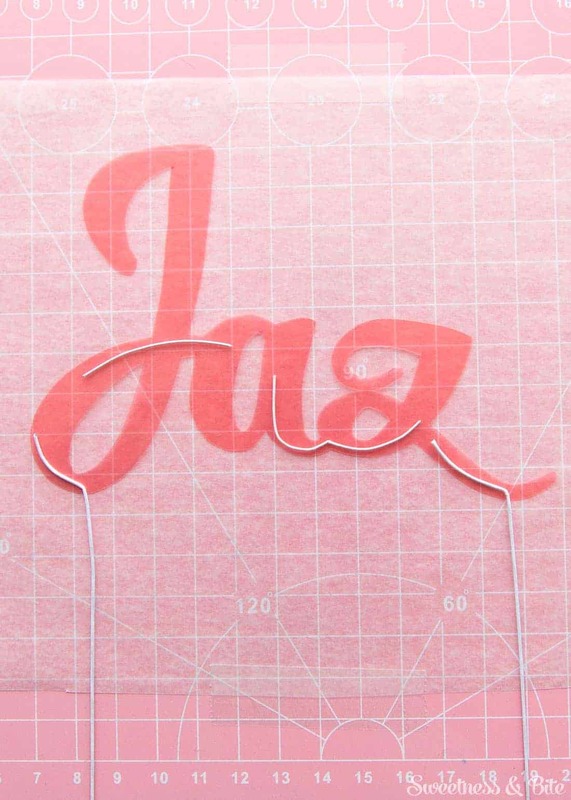 Begin cutting around your letters using a craft knife or scalpel. If you find your knife dragging or pulling at the gum paste too much, try applying a bit of shortening to the tip of the knife. Don’t panic too much about drag marks or pulling though, you can smooth them out later. Remember that as you cut you can move the whole board around to get the most comfortable angle. As you finish a section, it’s good to cut away the excess paste from the outside. When it comes to fiddly bits like the tail of the ‘z’, trim around it so there is about 4mm remaining, then use lots of small vertical cuts to trim close around the point. You can then use a tool like a silicone tipped paint eraser or sugar shaper to smooth and round off the point. Once you’ve cut all of the excess paste away, use your silicone tool to go around all of the edges, smoothing any rough spots. You can also go back with your scalpel and trim any little flappy bits. To remove the template, loosen an edge and very gently pull it away. If it’s doesn’t come away easily, you can slide a soft paintbrush between the plastic and the gum paste and use that to gently ease it away. Carefully remove the tape and remove the waxed paper from the board, leaving the name in place, still stuck to the paper. Rub a second piece of waxed paper very lightly with shortening (and I do mean lightly here, you can wipe over the paper with a piece of paper towel to remove any excess), place the sheet (shortening side down) over your gum paste letters and gently rub over it with a fondant smoother to further flatten the letters and adhere the paper. Place the whole thing into a resealable plastic bag. 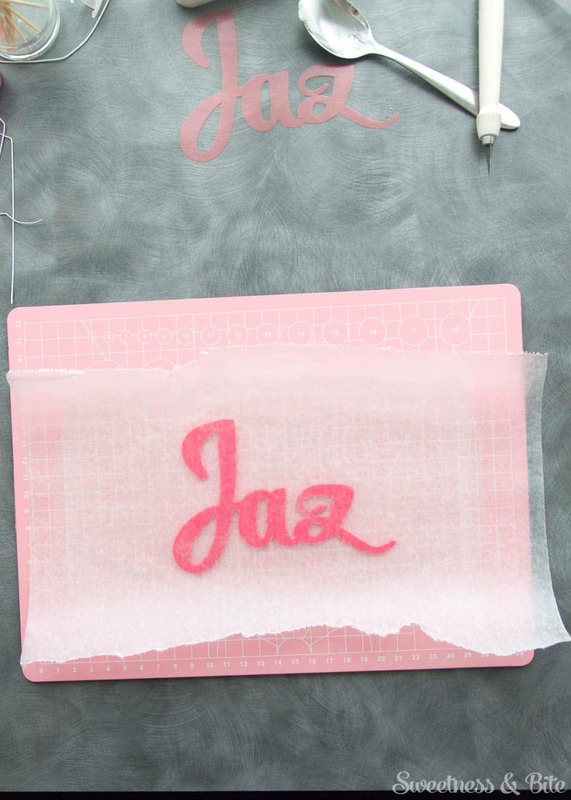 If you think the gum paste has dried out too much as you cut the letters, you can place a slightly damp paper towel into the bag with the letters, just make sure it doesn’t touch the paper or the letters. This will help keep the gum paste soft. Repeat the process to cut out a second set of letters. 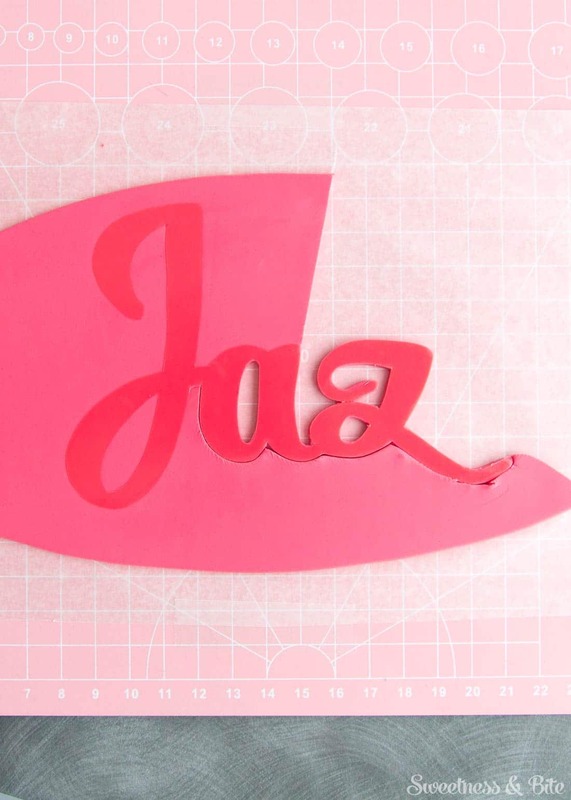 Once they’re cut, leave the plastic template on the letters and set this piece aside. Remove the first set of letters from the plastic bag. Find your bits of wire, and stick them onto the top (front) of the letters, adhering with a little sugar glue. Press the wire down gently into the gum paste using a fondant smoother, aiming to embed them about halfway into the gum paste. Brush a little more glue over the top of the wire. Paint a small amount of vodka onto the rest of the letters, just enough to lightly dampen the gum paste, and making sure you go right to the edge. I like to use vodka as if any seeps out between the layers, it will evaporate. Sugar glue will dry shiny and look messy. If you don’t want to use vodka, then water is the second best option, but be very sparing. Gently flip over the paper with the second set of letters, and peel off the paper from the back. Flip the letters right side up (the plastic template will keep the letters in place) and place it over the first set of letters, lining up all the edges. 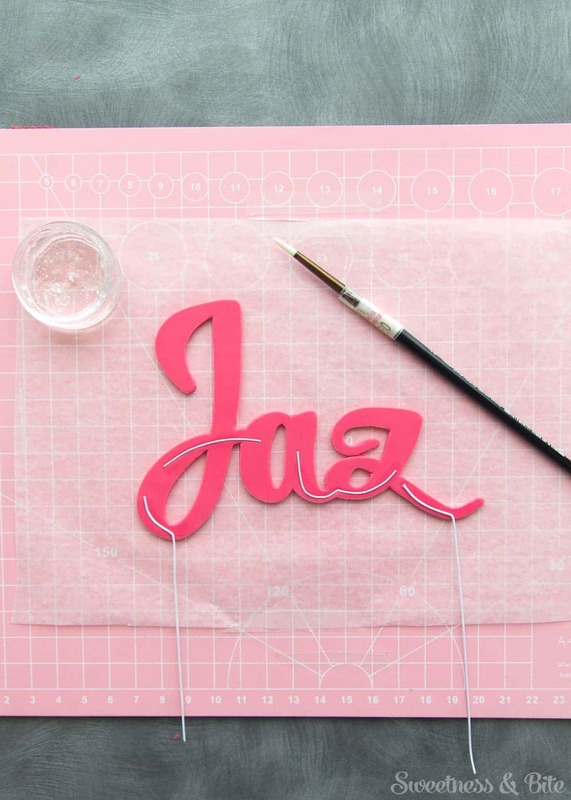 You can use your silicone tool to gently nudge the letters into place so they line up and use it to smooth the joins. 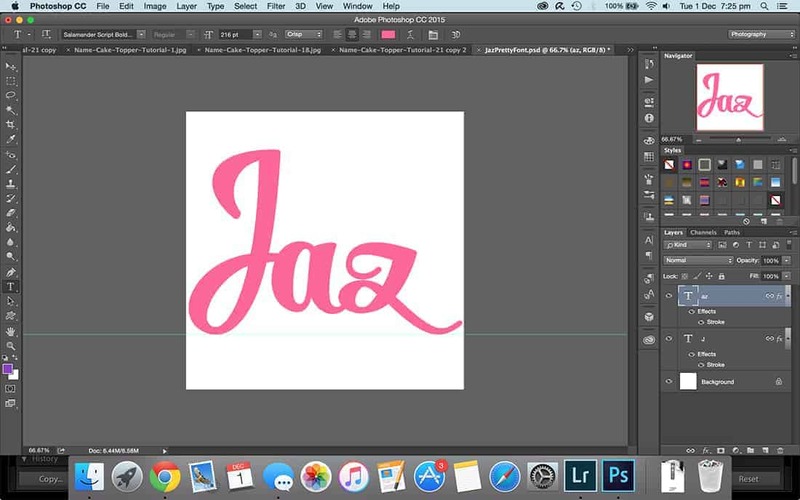 Leaving the template in place while you do this will stop the letters getting misshapen. 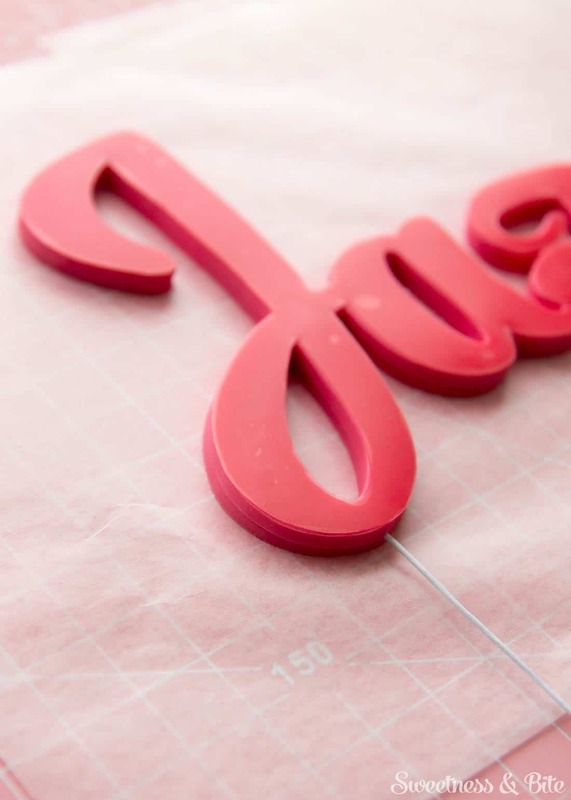 Use a ruler to make sure the bottoms of the letters line up nicely and that the wires point straight down. Or you could use the lines on your cutting mat, if you remember that they’re there, which I clearly didn’t. 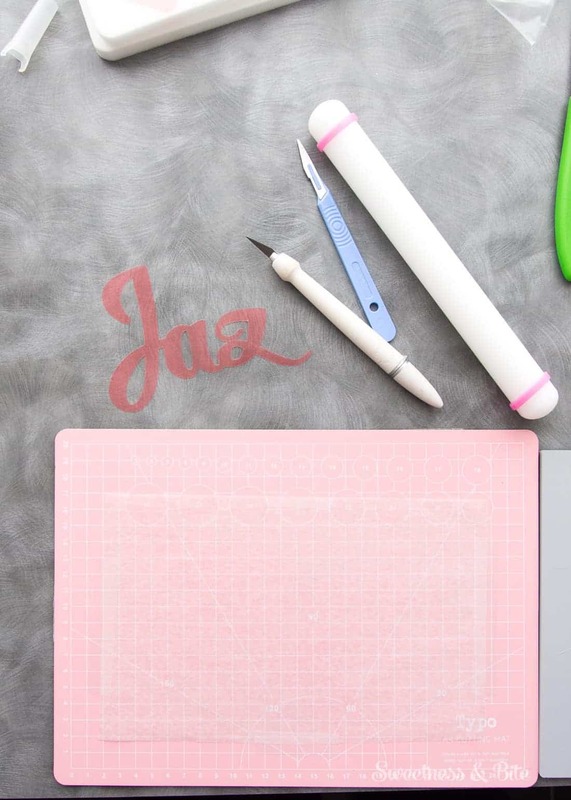 Leave to firm up for half an hour or so, then remove the template from the top, smoothing around the top edge of the letters with your finger to remove any drag marks (use a little shortening on your finger if they’re stubborn marks). Leave for a few hours, then place a foam pad over the letters and flip the whole thing over, and remove the back piece of waxed paper. Leave for several days (a week is better) to dry, gently turning the letters over occasionally so they dry evenly. Now here’s the bit you will either love or hate me for, but it is very important. Do it all again to make a second topper. And if you’re clumsy, or have less than a week for the topper to dry, do a third set. Remember that an extra half hour spent now making another set will be far better than breaking your only topper at the last minute and not having time to make a new one and have it dry in time. Trust me. One word: experience. 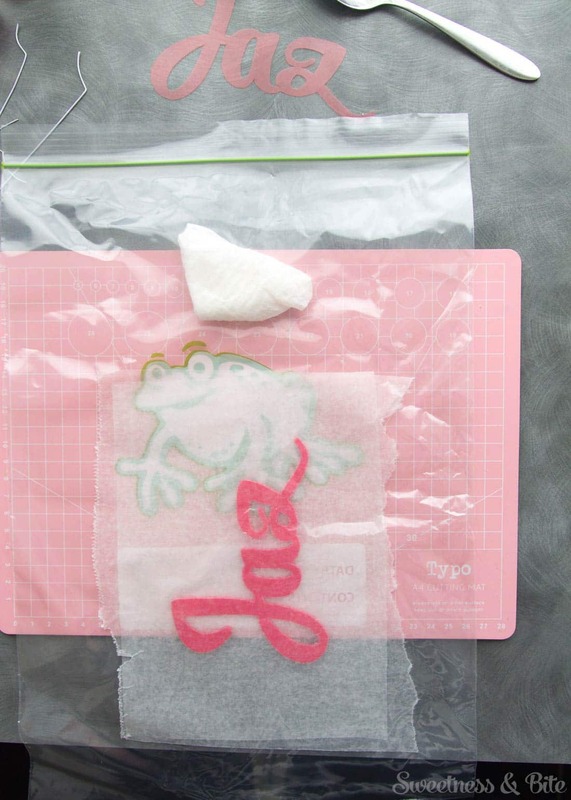 Place the toppers into a cardboard box, and store in a cool, dry place until you need to use them. If it’s humid where you live, add some silica gel packets or dry rice to the box to help absorb moisture. To insert the topper into the cake, first decide where on the cake you want the topper to go. 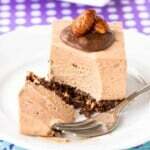 Use the tips of the wires to gently mark on the top of the cake where they will need to be inserted. 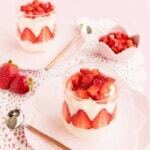 I don’t recommend inserting wire (even paper covered wire) directly into a cake, so you will need to use flower picks, small straws or as I used, plastic lollipop sticks with holes through the middle. Trim the wires on the topper slightly shorter than the length of your straw/pick/stick (which in turn should be slightly shorter than the height of your cake). 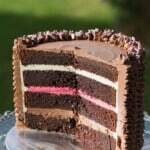 Insert each straw/pick/stick into the cake using the guide markings. Once your cake is delivered and all set up, gently insert the topper into the straws/picks/sticks. I don’t recommend travelling with the topper on the cake – always wait until the cake is set up. So there you have it, one (or more, you did make a spare, right?!) 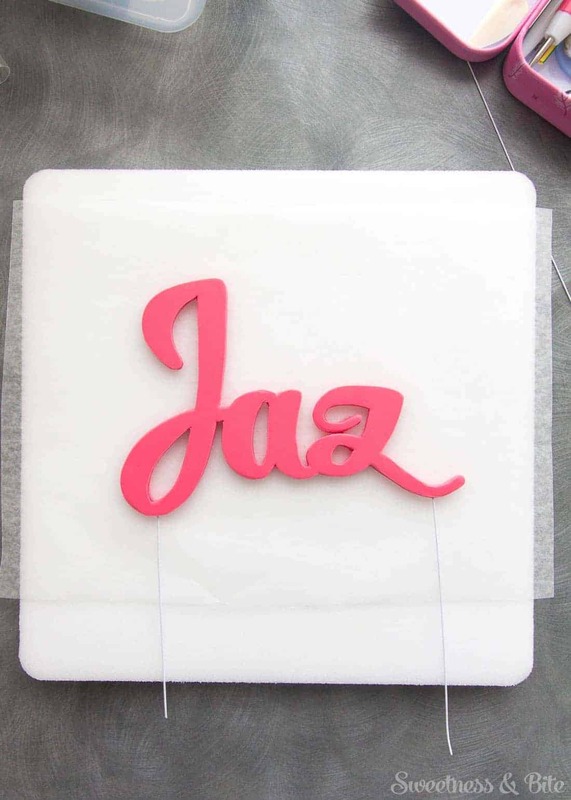 gum paste name cake topper. I’ll be back soon with a couple more tutorials for the sprinkle and watercolour tiers of this cake. What a great tutorial. I have never thought about using wire, but will definitely be doing so in the future. Thanks for sharing! 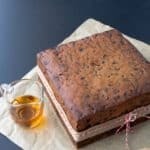 Did you cover the board with fondant or paper? It’s covered with fondant, with tylose powder mixed into it. 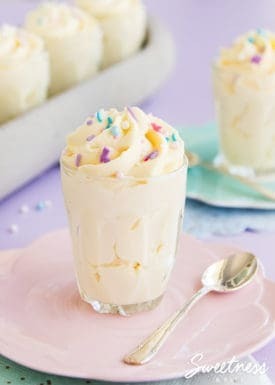 Can this be made with fondant instead of gumpaste? So clever, using a lollipop stick for the wire, great tip! Thank you for the tutorial. I hate to say this but … It may just be me but I found the tutorial somewhat complicated as well. I got lost with the plastic and marker. I I love the concept and the cursive lettering. I know how to print from computer but I will have to figure out the transfer effect or this plastic. Thanks for he video though. Awesome!!! 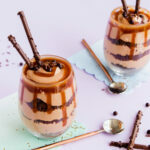 Looks great and a very informative, easy to follow tutorial. Thank you so much for sharing!!! Love it! Only just found you and I’m hooked!!! Enjoyed the tutorial, pink on pink was good. Thank you. This is really amazing!! Love it! Thank u for sharing, really love it!! Really great tutorial, I love your style….I can hear your voice in my head (no I don’t hear lots of voices, your writing is so natural it’s as if you are in the room) I appreciated all the little tips because I do the same sort of mistakes, forgetting I’ve got lines and measures on the board..typical me. Thanks for sharing your skills. Hi! Great tutorial. When you say plastic. What kind ? I got confused just a bit too. Lol I’m not sure what you meant by plastic. Thank you! Do you mind sharing the font size? Just curious, the wires are not covered up? So if one where to view it from the back, the wires will be visible? 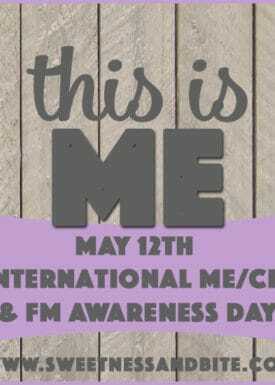 If I had known this just this morning! I made a number 25 cake topper for my friend’s birthday cake and the 5 snapped in two as I was inserting it into the cake! Heartbreaking moment! If I had known this little tip beforehand, it would have saved me great disappointment! Thank you for this tutorial! Gorgeous topper!